It's inevitable, I suppose, that sooner or later I'd end up dressed as one of my Everquest characters. Fortunately, I had company! 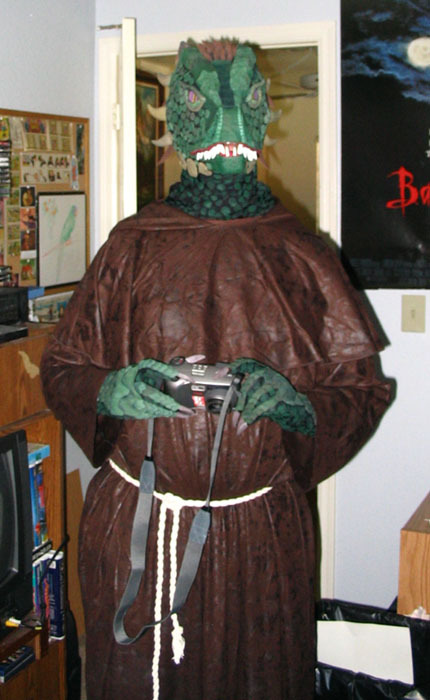 This page'll focus mostly on the Iksar (lizardman) costume I made for Robbie (my at-the-time friend, soon turned boyfriend, and later turned husband). 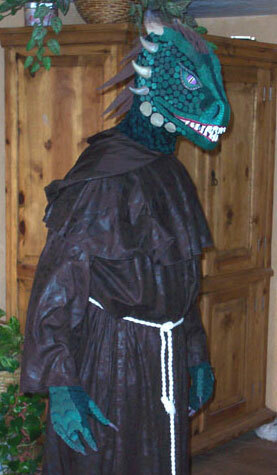 That's his character, Ataraxia, though we're not sure how much he looks like a shaman in this costume (more a monk really). Back to the lizard! 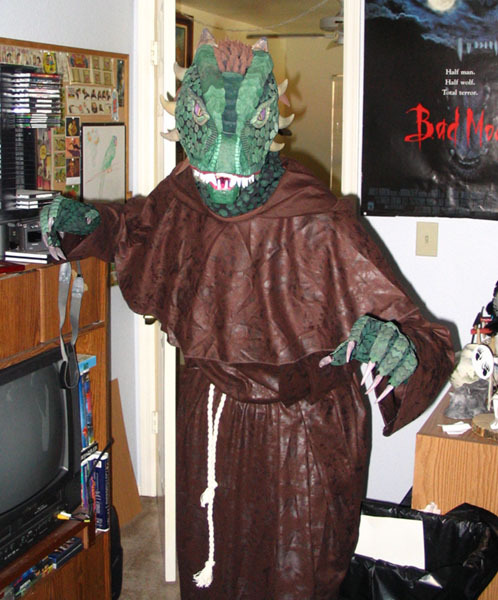 This was a very quick costume to build, we only had a couple full days to work on it between the time Robbie got here, and Halloween. I did get a little work done before he got here, the eyes, and many latex pieces (horns and scales) were already made and cast. 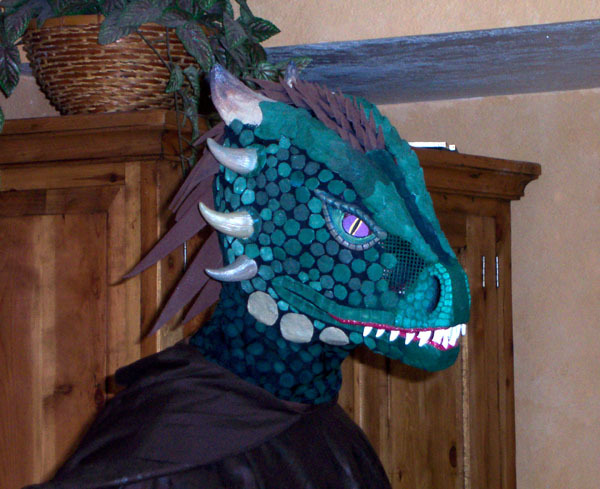 He patiently endured many hours of me working with the mask and trying it on him, sewing on the black spandex cloth which acted as a base under the scales, attaching the teeth, eyes, horns, and the rows of foam spines down the back of the head. The eyes are done in the typical style I've been using lately, cutting apart those cheap googly-eyes and using them to make slightly more realistic ones. His were painted violet and gold to match his character, and as an added bonus, seemed to follow you any direction you looked at them from. 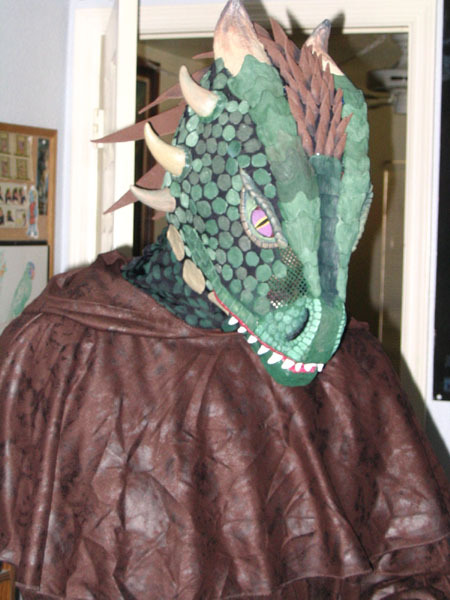 The eyelids and scales just around the eyes were sculpted especially for that purpose and cast from latex. The scales were pieces of latex, colored before they were put into the mold, and individually applied (using latex as an adhesive) to the mask and gloves. Anywhere that didn't get latex scales (the underside of the gloves, and the neck on the mask), got painted ones. 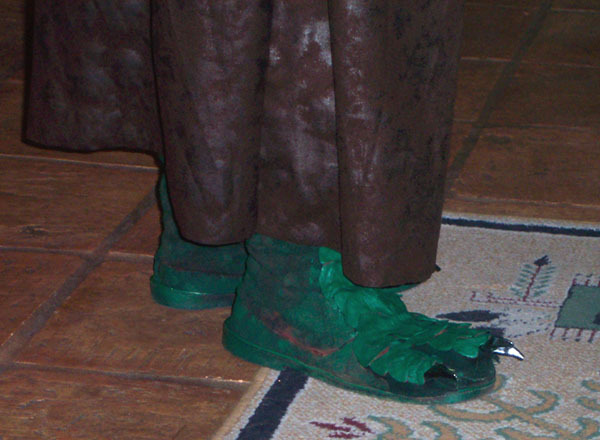 For the feet, we just pilfered the ones from T'char and spraypainted them green to match the rest of the costume. 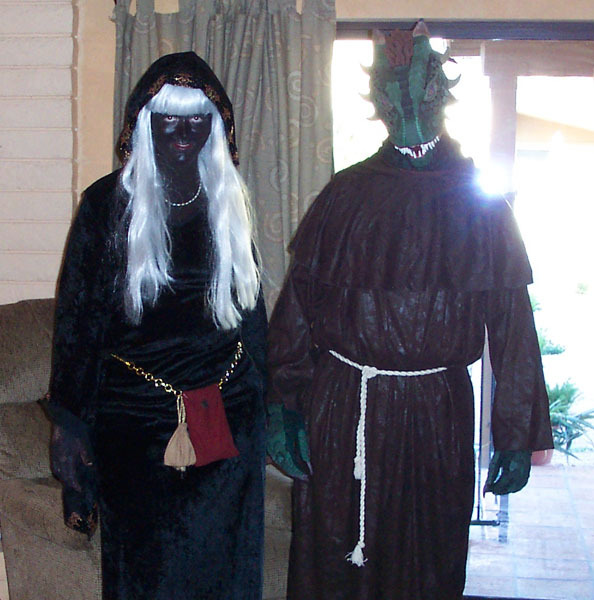 (Okay, so a lot got pilfered from T'char for these costumes!) And the red parts you see in the picture of the feet are not because we missed a spot! The green spraypaint was actually absorbing through the red in places... but it worked well enough for its intended purpose. It came down to scrambling to finish on the last day (as usual! ), but we had a good time at the Phoenix Zoo's Halloween celebration, Boo at the Zoo. 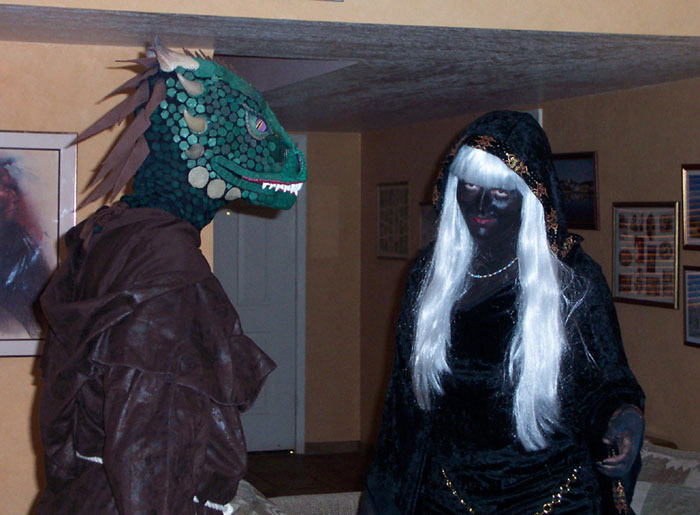 Even if only about two people knew what a drow was, and just about everyone mistook Ataraxia for a dragon or dinosaur. (Well, he does look a little dragony, I suppose...) But he had fun hissing at random children, getting random photos taken, and gathering a massive crowd while he drank Sprite through a straw... and I had fun watching people's reactions and leading him around by the arm. It was rather nice to be able to see how people reacted to one of my masks; usually I'm in the mask and seeing anything is a bit of a feat! I did eventually take Robbie back to the Phoenix Zoo so he could actually see the animals.